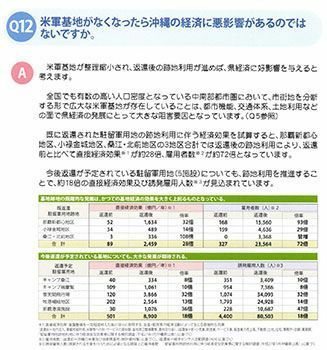 Pictured is a page of the pamphlet containing examples of economic development using returned U.S. base land, and an answer to a question about if U.S. military bases being withdrawn from Okinawa would lead to negative economic effects for Okinawa. On April 10, the Okinawa prefectural government (OPG) finished producing question-and-answer format pamphlets presenting the problems at hand with U.S. military base issues in a way that is simple and easy-to-understand. Examples of misinformation and baseless allegations regarding Okinawa have been seen here and there, which is keeping resolutions to base issues at bay. The goal of the 40,000 pamphlets is to provide correct information. Most will be sent to schools and private businesses in Okinawa, but the remaining 1,700 will be distributed in cities, towns and villages throughout Japan. These pamphlets answer questions including the following: Weren’t U.S. military bases built on empty plots, and don’t people live in the vicinity? Isn’t Okinawa’s economy largely dependent on U.S. bases? Wouldn’t revising the U.S.-Japan Status of Forces Agreement be troublesome? In addition the pamphlets explain Okinawa’s state of affairs using statistics and pictures related to Okinawa’s history, the layout of prewar villages, Okinawa’s economic climate, and the current status of U.S. military stationing agreements in other countries. The Oura Bay site in Nago planned for Futenma Air Station’s replacement facility is home to 5,800 species of animals and plants including 262 endangered species. These numbers are comparable to those of Japan’s World Natural Heritage sites. The pamphlets include photographs of these species and the coral reef. Head of the Executive Office of the Okinawa Governor Kiichiro Jahana said, “Currently there are many misunderstandings in regards to Okinawa’s base issues, including among young people in Okinawa.” He hopes people across Japan will understand the truth regarding the formation and history of bases in Okinawa, and that this understanding may lead base issues to be resolved.